Moving the herd to slaughter has proven more difficult than I imagined. It’s easy to pluck out a bunch of worms from the system. It’s getting them clean from the “horse fiber”. As the worms consume the bacteria and fungi that are breaking down the horse buns, the lignin in the hay they eat breaks down slowly and you get this felt like look on the top of the worm bin. This is the sign that more feedstock (horse manure) needs to be added. I call that felty looking stuff horse fiber. At this time, it is easiest to collect a bunch of worms simply by grabbing them with your hands. I’m going to try this for separating them. There’s a 225+lbs of worms in the three flow through reactors. They’re technically called Continuous Flow Through Reactors, but they’re really just boxes with a grate at the bottom as you can see in The Wormery video. In the flow through design, the worms primarily stay at the top of the system. 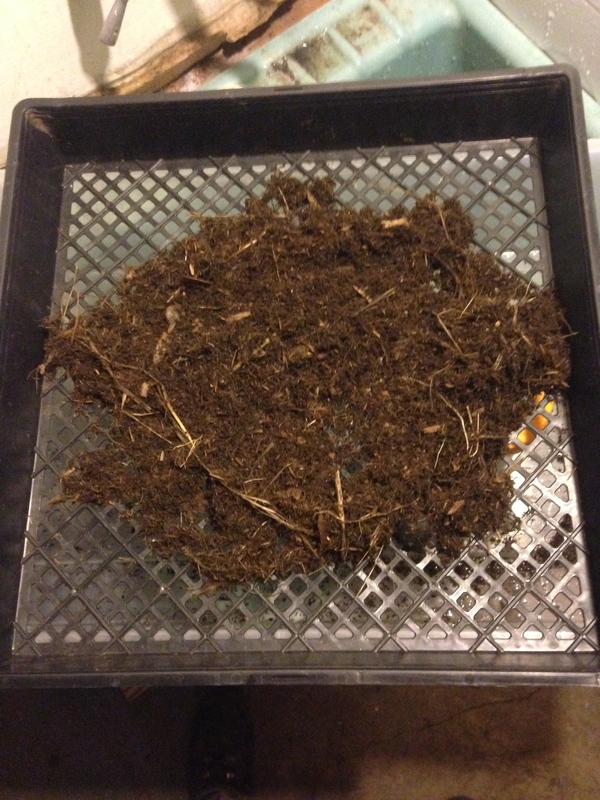 As more food is added to the top, eventually Vermicompost (castings and composted bits) come out the bottom. That’s why there’s a grate at the bottom. I like these systems because they’re fairly easy to harvest castings and, of course, worms. 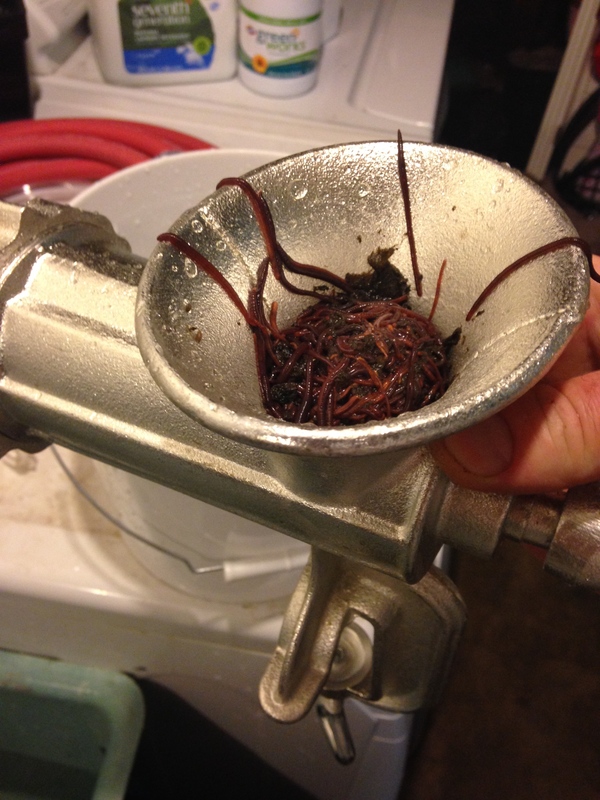 Only, I’m looking for clean worms to make fish food for the aquaponics system. I’ve found the best time to get the most worms is by grabbing some with your hand when the foodstock is almost gone. That’s when the top of the worm bed looks like it’s been groomed and no horse “buns” are visible. When it is time to harvest worms, I just grab a fistful from the top of the system and keep repeating. The trick now is how to wrangle them wrigglers from the leftover fiber. To figure that out, I’ve spread some worms and fiber over a nursery flat that has holes hoping the bright light from above would drive the worms down. Worms are slow. Worms are even slower when you are impatient and stand over them. In another experiment, I placed a piece of pumpkin in a bucket with another few fistfuls of the herd. The pumpkin is a little too fresh, surprisingly. I bought that thing quite a few months ago and it’s been banging around my car most of that time! I had hoped that it would be more suitable for worm food. The flow through reactors are amazing for breeding worms and getting castings, but I think it might be best to add another level in the worm harvest to make it easier to extract clean worms. A more traditional worm bin might be a good option in combo with a flow through as the use of a trommel will help with getting a cleaner harvest. A trommel might work with the way I’m harvesting now, but I think the fiber will still get in the way. At least that’s what I’ve found with my “trials”. I don’t have a trommel, but I’ve been playing with screening. Sorta the same. Needing to leave for an event, I cut my worm wranglin short yesterday. Sort of stymied by the “horse fiber” getting in the way of separating the worms. I started to think that the Flow Through design could be best used for breeding worms and collecting Vermicompost, but might need to harvest the worms from there and transfer them to a finishing bin. The finishing bin would allow me to control the food and be able to lure the worms to the other side. Then it occurred to me on the bus that I could probably just do that with the top layers of the flow through system. I’d still put them in a finishing bin, but just for a couple days. Well accidental science strikes again. Having left in haste yesterday, I left one of my trays I was working with uncovered. The horse fiber bedding material dried up rather quickly. I started to pick out some of the dried up worms when I discovered all of the live worms all huddled together in a wriggling mass. Jackpot! Going to try this method some more. 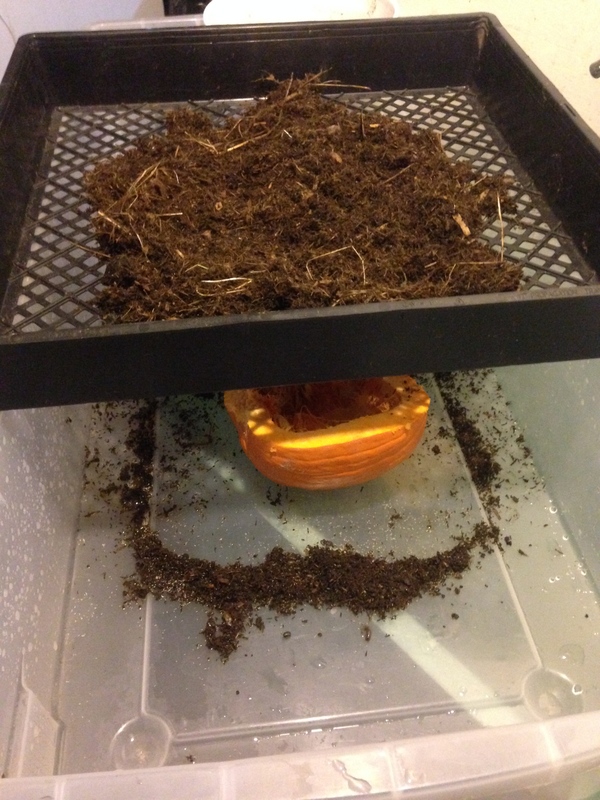 I set out a tray with some moist bedding and worms. Then spread it out thin on the tray and added some moisture to one side to see if they’ll migrate there. I think there might be some benefit to keeping a bit of a moisture highway so there is a little moisture lengthwise in the tray as well. We’ll see what happens! Found an old worm cafe. It’s a 3 tiered worm systemthat is pretty commmon. I took off the first bin so that I would have just two of the perforated bins stacked above one bin that wasn’t perforated. The idea is to put the harvested worms from the flow through reactors in the top bin. 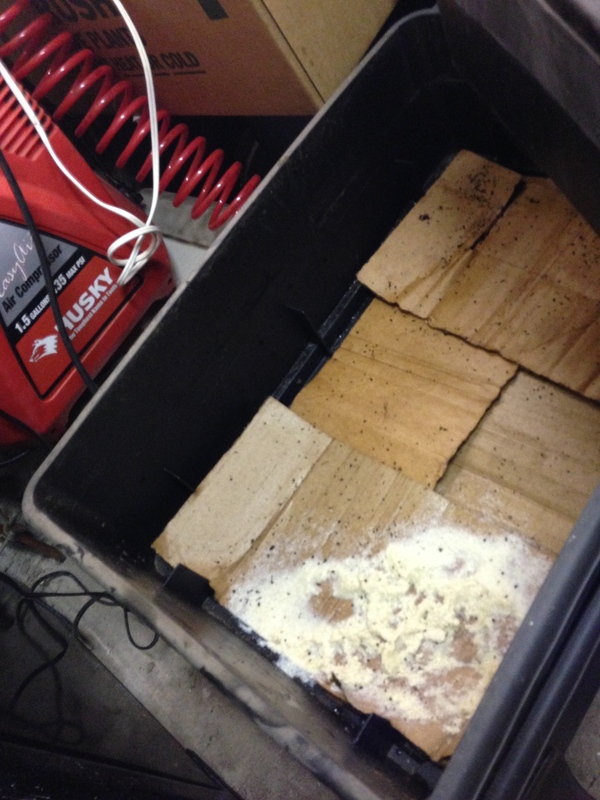 The bottom bin has wet cardboard and baby oatmeal to entice the herd to a cleaner environment to grind into food. I had a hunch that worms would like baby oatmeal. Actually, they like what eats the baby oatmeal–fungi and bacteria. After a few days many of the worms migrated down to the fancy feast I prepared. I waited 10 days. The oatmeal was gone and they had started on the decaying cardboard. There were quite a few worms in there ready to try out the new process. How do you grind up worms to dry them to make worm meal? 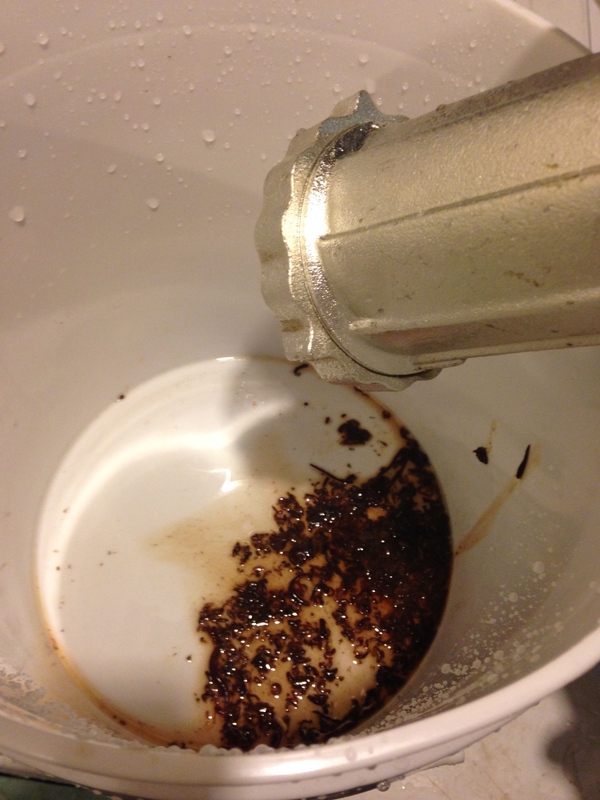 It seemed like a meat grinder would be the best way to “process” the worms. After cleaning and assembling the meat grinder, I was ready to gather the herd for the final steps to this experiment. Washing the worms from the bits of cardboard where they were left after pt. 3 of Moving the Herd wasn’t too hard. They really start moving when cold water hits them. 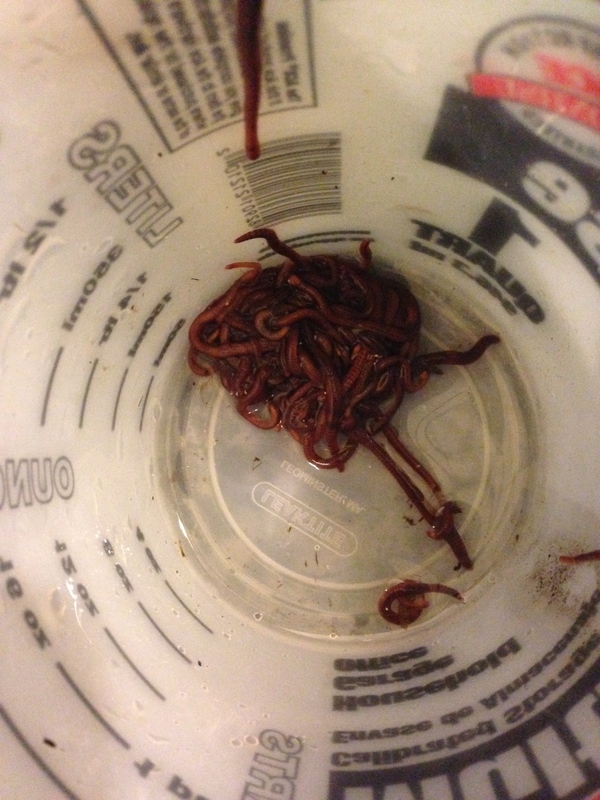 Originally, the plan was to extract the worms and pulverize them with mortar and pestle. Hoping to get a fine dust to make a paste. That proved difficult as they are like little pieces of jerky when they are dried. They don’t taste like jerky. I gathered about 1/3 of a pound of worms in the hopper ready for the first grind. After a few cranks they started working through. Sorry worms. This is in the name of science. My cranks slowed to a stop as the horror show came to an end. After pulling apart The Vermi-nator, it was clear that my hopes for a paste were chopped into bits. Wriggling ones at that. Maybe I just need an end plate with smaller holes. I’m just not sure this Vermi-nator is the right equipment for the job. Going to try drying them down to 10-20% moisture content and use a coffee grinder as the next method of processing. Either that or a food processor. Slightly used meat grinder. Email with best offer.